Imagination can be loosely defined as a veiled perception of truth. Mankind is the only living entity on this planet that can use imagination. It is a gift that most use negatively. Imagination is the picturing power of the mind; it is a constructive, or creative faculty if used correctly. Imagination has been the principal working tool of those outstanding people throughout the long annals of history, whose basic ideas have given us the means to allow us to develop and invent the necessities that allow us to live in the modern world today. Take, for instance, the mental explorations of the French author, Jules Verne, famous for his scientific fantasy, Twenty Thousand Leagues Under The Sea, a work that accurately describes our modern submarines. As one dwells upon the limitless creative resources residing within the World of Ideas in the Universal Mind, one is forced to accept the powerful motivating influence that imagination plays in today’s scientific developments. Without it no writer can create a story, no architect could possibly dream of the fantastic architectural wonders of today, or draft plans, neither could our scientists working in the various creative fields develop their modern inventions without these first having been discovered and drawn forth from the nebulous recesses of the World of Ideas in the Creative Universal Mind. Just because two people happen to tap into the same idea at the same time in different parts of the world, doesn’t mean to say that one has stolen from the other. It simply means that they have both accessed the World of Ideas at a similar time. There is nothing new on this planet, even though people will claim to have “invented such and such” or “discovered such and such”. All this information was encoded into the World of Ideas at the very inception of the planet, and it will be up to some creative being to tap into that level of consciousness at the appropriate time. You can do this simply by using meditation and thinking of a concept and then letting the concept build in your mind through a series of pictures in your imagination. Or if you want to know the answer to a problem, go into a meditative state, hold the question about the problem in mind, and wait for the answer to come. Sometimes, as many people have discovered, the answer does not come right away but might come several days later. The ways that this can occur are myriad. The Creative Mind is not restricted to one method only. 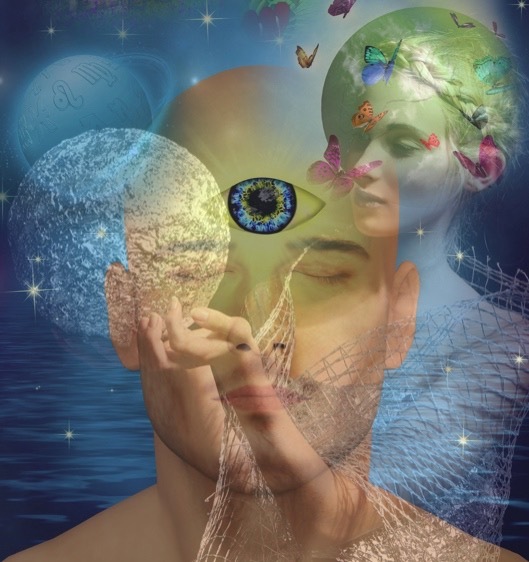 As greater numbers of individuals learn the constructive use of the creative imagination, a final link with the higher planes of consciousness may well become an established fact, and disease will slowly fade away from this planet. However, in view of the general surge of unhappiness, war, discontent, lawlessness, and disruptive conditions engulfing the world, never has there been a more urgent need for people to tap into their own creative imagination to receive an influx of constructive ideas to counteract and overcome the disenchanting influences. Please remember these words: “Know ye not ye are gods, sons and daughters of the Most High?” That being the case, remember that the Logos has given you the same creative power through your creative imagination. Use it to make your world beautiful and happy for all living creatures. This great gift is your birthright, and you alone determine whether you shall use the power or ignore it. The world seems to be disturbed by destructive thoughts, violence and restlessness. People are overly concerned with their worldly possessions and are anxious over the things they think they need and should have. Has everyone forgotten the blessing we each have in the form of life and consciousness? It seems that it is time for a deeper appreciation of what we do have, and what we can still enjoy. Stop and think for a moment, and you will soon realize that there is one great thing in life that cannot be purchased, that cannot be decreed by any dictatorship, that cannot be legislated or humanly supplied exactly when we want it. That one great thing is life itself. We may improve our health, sculpt our physical bodies, eat all the right foods; we may buy supplements that will extend the length of our life, we may be able to create things that will make that life temporarily happier. But all of these things depend upon the first great fundamental requisite, and that is life itself. Without life there is no need to seek for health, or to seek for happiness or peace; without life, there is no need for any of the things that man has created, or empires have organized, or that man can imagine. And yet the gift of life and consciousness itself is given to us abundantly by the Planetary Logos, our Creator. It seems to be something we do not ask for in the beginning as most people have no memory of lives between lives. It is also a thing, at this point, that we cannot control in the end. It is something that is given to all of us alike, regardless of race, creed, religion, social position or education. The humblest little ignorant person on the planet enjoys life in all of its vital essence, just as freely as do those who live with great power and material comfort and attainment. And yet, those who have the most collection of worldly things and other paraphernalia find these worldly possessions of absolutely no value when the time draws near and life seems about to ebb away and to be withdrawn as freely as it was given to us. There are two great mysteries that should hold the attention of everyone more than anything else in the world, and these relate to the understanding of life. The first one is connected to the beginning of life, and the gift of life to us, and the second one relates to the withdrawal of life and its ultimate existence on the earth plane. In this greater appreciation of life, we would become less anxious to destroy it, injure it, or make life more sorrowful for others. For this reason, too, all thoughts of war would cease and all thoughts of unnecessary destructiveness would come to an end. If a large portion of the world and its peoples could truly enter into a spirit of thankfulness for life itself, there would be no wars, no struggle for power, no struggle to gain material objects. Perhaps the oncoming cycle of the sixth age in the overall cycle of seven great ages will bring the peace and harmony that everyone desires and a heightened awareness with an appreciation for all life. If you consider yourself a Mystic, you differ from another only insofar as you are aware of your relationship to the Logos, and you refuse to let the stresses of modern day living interfere with your connection to the source of your own being. It is not easy, particularly at this time on the planet, to be constantly aware of your higher self, and seek guidance to live a truly spiritual life. This attitude requires the devotion of one’s soul, as well as the help of esoteric knowledge, teachers, and circumstances favourable for the learning process. Taken in the outer sense, life on earth has had a brutal history of construction, destruction, power struggles, and constant wars, to name but a few. To most people life seems to go nowhere; it consists of a series of difficult events that apparently randomly benefit culture or may equally accidentally or deliberately destroy it. Let us consider another history, which has to do with life on earth in an inner sense. Here, there is not the dualism of construction and destruction as in the outer sense, although this still happens, but in a much more subtle way. What seems to happen is the cycling of man’s inner powers in an upward direction toward attunement with the Source. The outer history is concerned with time, while the inner is concerned with dimensions outside of time. Outer history is full of past and future, of stress, anticipations, anxieties, fears, anger, and remorse over failure. There is no rest, only the flurry of activity in time. There is also the fear of death. The inner account begins outside of time. Every “moment” touches the Source, the Logos. There is no rush toward a paradise of the future, for paradise is a state of being and may be experienced now, outside the restrictions of time. 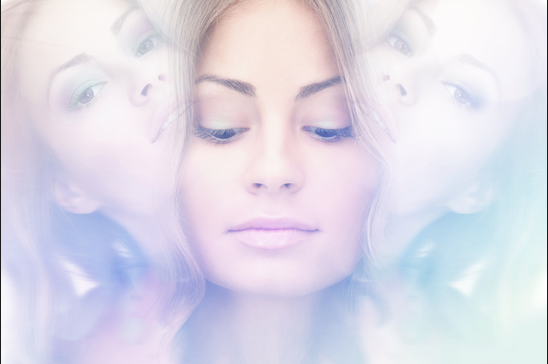 It can be experienced through attunement when the body and physical consciousness are in a state of meditation, and then brought back into the physical reality as a state of consciousness. There need be no running forward in time to bring an increased consciousness of the present. An emotionally purified consciousness is imperative to a mystic as nothing destroys the possibility of attunement like faulty emotional functioning. Meeting this necessity may be difficult at first, for our society condones the use of destructive emotional forms. We are taught to hate the enemy; our TV and our means of entertainment exhibit a stream of every kind of emotional contamination available. Of course, it is possible to live with all this, if you find other means of entertainment, such as an engrossing hobby of some description. Intelligence is somewhat better understood than the emotions. This is a century of mass education and brilliant technology, and for good or ill, everyone has come to believe in it. It is a pity the education is not focused more on mastering life than gathering useless facts. The chief use of intelligence is not so much in becoming learned, as in being able to direct and integrate the different aspects of one’s being. Only when the emotions and intellect work together can advances be made in the inner life. It is possible to know a thing without having feeling for it. This is one of the unfortunate aspects of our scientific world. By persistent overuse of the analytical method, most people have lost the power of intuition. Of course, logic and the analytic method are indispensable to our three dimensional world, but if we are really to hear and to know the inner levels of consciousness, we must become silent, and listen to the still, small voice of intuition. Mystical training cannot be accomplished in a group or at the social level, however, until you reach an advanced stage of development. First, you must leave yourself; that is, leave your little ego-self behind, and then return to yourself transformed. Only when you have trained yourself through diligent private practice will you be spiritually mature enough to integrate with, learn with, and possibly teach others. Once transformed through your own diligent efforts, you will no longer be the slave of falsehoods because you will be in touch with your own higher self and will have moved from being a normal personality to a soul-infused personality. This is the mystic’s task. Difficult it may seem, but it is the only reliable and worthy way to bring personal and group effort into harmony with universal law. 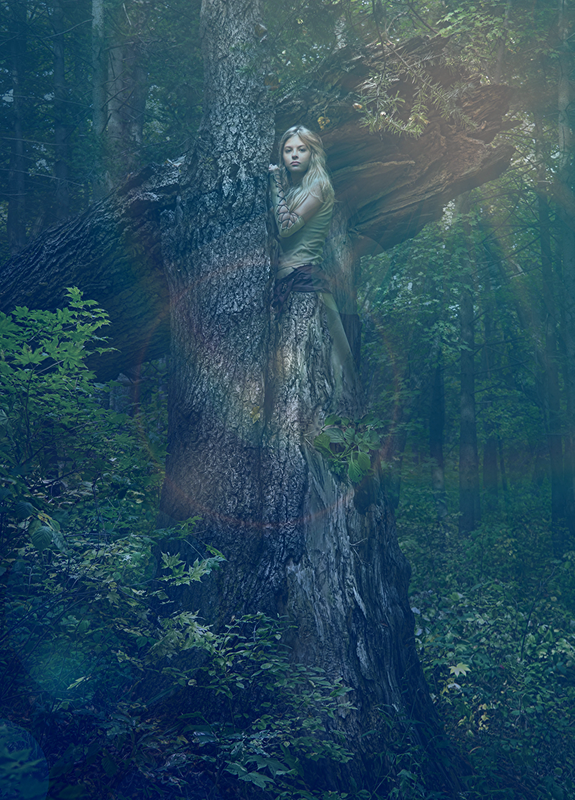 You may not have thought about fairies since you were a child—but they exist! They are beginning to interact more and more with humans whom they think can help our ailing planet. If you wish to connect with the fae, but have not seen one, you will discover that there are many different pathways to fairyland because you arrive at the fairy pathway by your own personal route. It all depends on the particular aspect of their realm that you are drawn to. If you are interested in working with the environment or crystal healing, then it would be the gnomes who you will attract and become aware of first of all. If you spend a lot of time in your garden and enjoy the flowering plants, then it would be the flower fairies who initiate contact through your dreams or meditations, before appearing before you. 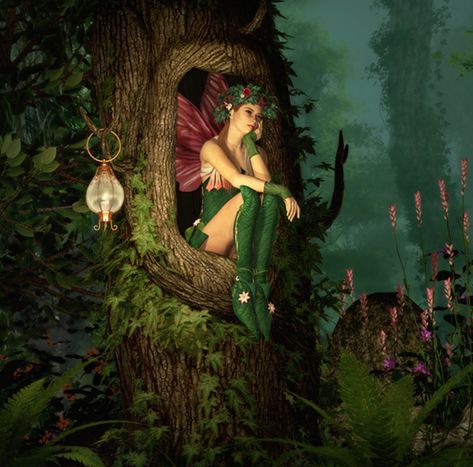 Many people are now seeing fairies, although most people perceive them through creative inspirations, intuitive feelings, meditation, or dreams. The more you think about them, the more likely you are to see them or perceive them with your subtle senses. If you do manage to visit Fairyland, either in meditation or in the dream state, there are certain rules that you must follow without fail. Never, but never partake of any food or drink, however tempting it may appear at the time. Never ever dance, because eating, drinking or dancing can lead to fairy entrapment for the unwary, and can lead to perilous circumstances. We all love fairies; they exist. However, they exist under a different set of rules, and these rules must be respected. If you are clairvoyant, or even if you are not, and you are thinking of visiting fairyland, please read the book, “The Secret Lives of Elves and Fairies.” This is from the Private Journal of the Rev. Robert Kirk. It describes exactly what to do and what not to do. The most famous modern interpretation of the Last Supper has to be that of Salvador Dali in his “The Sacrament of The Last Supper,” which hangs in the Chester Dale Collection of the National Gallery of Art in Washington, D. C.
This is absolutely striking proof that this historic subject will never lose its appeal for the artist. In Spain, Dali painted it along classical lines. He depicted the whole scene as seemingly floating in space to suggest the highly spiritual nature of the event. The dodecahedron, that twelve-sided figure that Pythagoras, the Greek philosopher said was the symbol of the universe seems to float above the table. 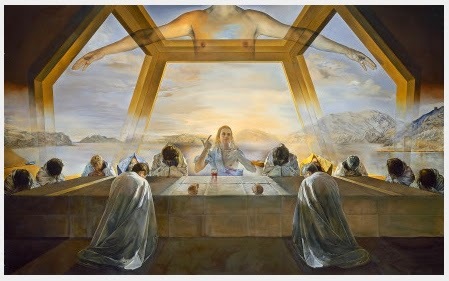 Dali centered his theme upon “The Sacrament of the Last Supper” instead of merely “The Last Supper” as all the others painters seem to have done. We indeed wonder if there will be more versions of this wonderful subject in the years to come. It is one of the most challenging scenes in the Bible, and I feel other modern painters in the future will again take up the challenge to render the spiritual side of this Biblical event. Do you often day-dream? There comes a time when your dreams must be brought into the light of day if you are persistent, but do you put yourself into the category of one of the thousands whose thoughts never get beyond the stage of wistful thinking about what you want or what you want to do? Do you often come out of a daydream thinking, “If only I could make it real?” All things, all manifestations, begin with thought; it is what follows that thought that may lift you from the class of those who hope and dream, into those who can manifest what they want. Thought energy, like anything else, can be dissipated, or it can be used to produce actual effects. If you know how to construct your thoughts, you can stimulate the creative processes within your mind and through them, you can assemble the conditions that you desire to make your life a happy one of accomplishment. Mental creating does not depend upon any magical process. It consists of knowing how to marshal your thoughts into a powerful energy that draws and organizes your experiences into a worth-while design of living. What tomorrow, next week, or the years ahead will bring to you in the way of success and material goods is largely up to youself. Your mind is naturally creative. Through proper application of your thinking processes, you can, in your mind’s eye visualize a desired goal, and through such visualization actually bring this goal into manifestation. Creatlve power like this is natural, and based on simple laws that can be utilized by everyone capable of thought. There is little cause today for the average man and woman to go through life a victim of circumstances, when this divine power lies inside everyone. Remember that energy follows thought, so HOLD IN YOUR MIND AND YOUR THOUGHTS WHAT YOU WANT TO CREATE. Never, but never think about what you DON’T want as that will surely outmanifest. If you are prepared to put some time and effort into it, you will find that intuition is really quite a natural process that most people can access, but few rarely do. Even if it is accessed, some will brush it off as merely imagination. Intuition relies on trusting subtle impressions that you receive when you ask a question, or it may come as a warning about something. The answers just feel right somehow, and if you trust in the process, you will find that life will begin to run more smoothly because of this intuitive awareness that comes to your assistance. Some people like to call this “guidance.” And in a way it is. The more you practice listening to your guidance, the more it will work for you. It is the same as any other talent—it needs to be practiced to work well. However, you do need discernment as to whether you can trust your intuition. 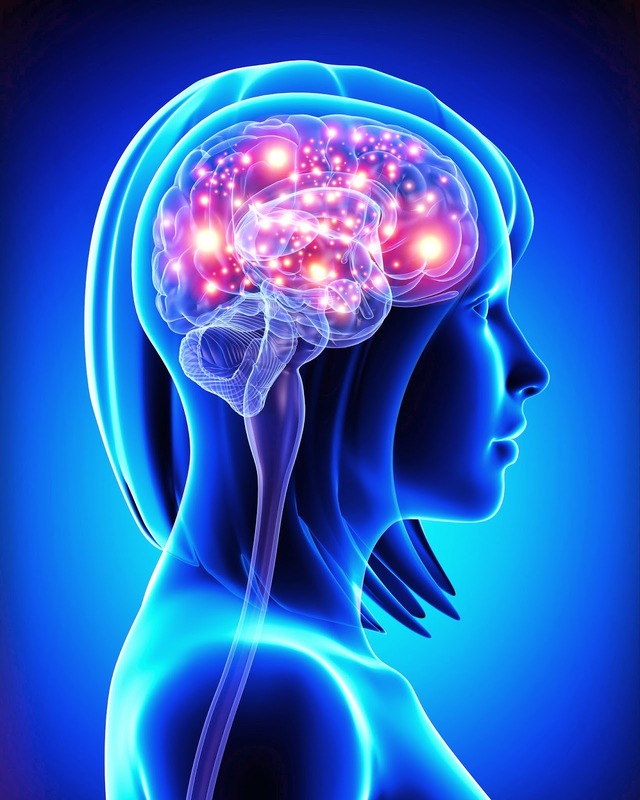 It may be coming from your own brain centres or emotional body. One way to check if your intuition is genuine, is simply by asking the question: “Is this information coming from my Higher Self?” The Higher Self will always answer immediately, without hesitation, in a positive, uplifting manner. If the answer is hesitant or seems unsure when you question it, the information is probably coming from the emotional level, or from the brain centres. If the answer has indeed come from the Higher Self, it will still be there, and you will feel steady and sure that this is right for you. If you would like more information on how to develop your intuition further, you will find some tips below. Meditation is an excellent way to develop your intuitive awareness. There are various meditation techniques available today, and it is just a matter of finding one that suits your temperament. Highly active people like moving meditations while running or jogging, while more passive types like to sit or lie down to meditate. As relaxation is a natural side effect of meditating, this can be an excellent way to start. When you are relaxed and the mind is quiet, it is easier for intuitive impressions to impact upon your consciousness in the form of visions, the inner voice, or just through your awareness. Never let the stresses of every day living impact upon you. Look upon them as tests on the pathway of life. This will do much to improve your intuitive ability. When you remain positive, you naturally tune into the more positive streams of energy available, and this makes it much easier to use your intuitive ability. If you need to make an important decision, release any tension you may be holding, relax your body by doing a few stretches, and then let go of all unnecessary problems, and head off to quiet, peaceful surroundings where you can tune in and listen to your inner voice; that voice is always there—but it won’t be apparent until you still your mind and emotions enough to hear it. Allow some time for your intuition to filter through to your conscious mind. If you are a little stressed, it is like stirring up a muddy pond—you have to wait till the sediment settles so you can get a clear answer. With a little practice you will reap benefits you have only ever dreamed about. You can also try out this great meditation on our youtube channel. Further information on other interesting subjects is only available through the Sirian Mystery School, a division of the College ofEsoteric Education.